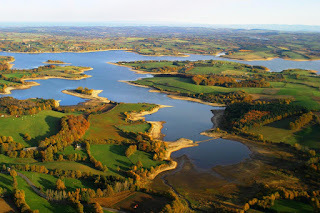 The popular Rainbow Lake near Bordeaux in southern France keeps on producing record fish. The last couple of months several 80lb+ fish were caught, including a new common record at 88lb. Several British websites reported the capture of several huge Rainbow Lake carp over the last couple of months. Angling Times wrote about The Ken Dodd fish at 87lb+, while several blogs reported captures of at least 4 common carp, with each one at least 80lb. 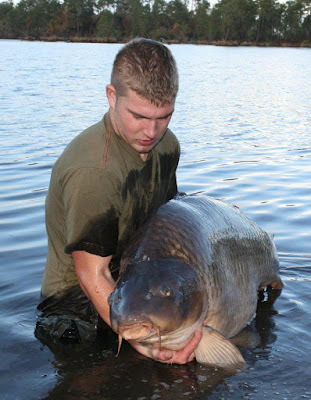 One of those huge commons is a carp known as 'Eric's Common' at a weight of 88lb. Below the picture of Ben Cooper with the new lake record common. At 88lb this common carp is very close to the world record common carp nicknamed Mary, standing at 89lb 1oz, taken by German angler Markus Pelzer in June 2011. Also caught recently were two other celebrity Rainbow Lake carp: The Briggs Fish (the biggest mirror carp and former world record at 94lb) at 86+ lb as well as another record mirror nicknamed The Ken Dodd fish at 87lb 8oz, pictured left on the top of this page. Also at least 3 other common carp were captured, including Eric's common at 83lb 4oz, a couple of week after this carp was landed at 88lb. Check out below the video's of the other two 80lb+ fish. Wow these are beasts, amazing how big these fish can get! Eric's Common was captured again by 'accident' at 81lb+. John Lilley got the fish mixed up in his line and managed to land the unofficial new world record common carp, that had a hook and line from another angler dragging around the Rainbow Lake.